According to `the Survey on the Ainu Living Conditions’ conducted in 2013 by the Hokkaido Government, surveyed the Ainu population in Hokkaido is 16,786 in 66 municipalities (Note 1). 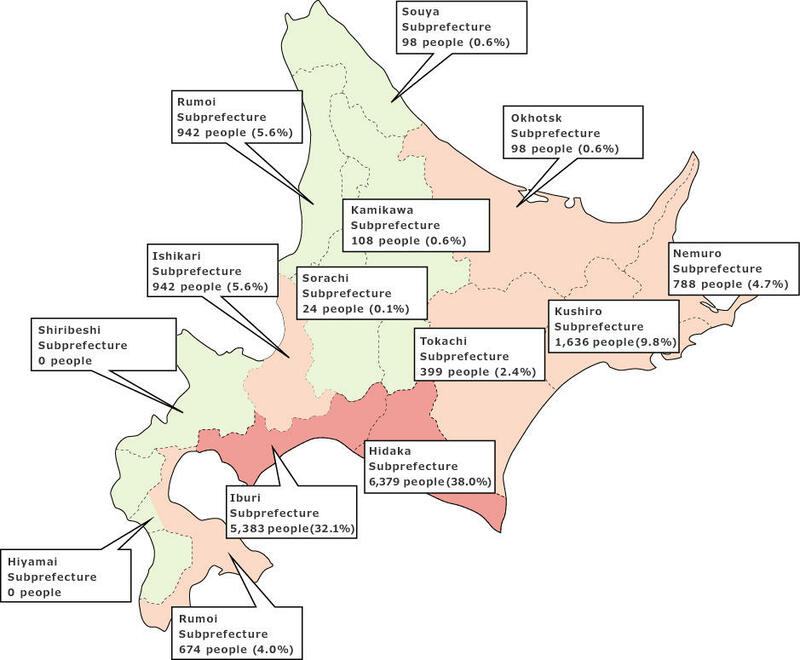 About 70.1 percent of these live in the sub-prefectures of Hidaka and Iburi (as shown on the map below). It is estimated that the Ainu population is far larger than the results indicate due to the constraints of the survey (Note 2). In addition, as the survey was limited to the Ainu living in Hokkaido and its questions were limited, the results cannot be said to fully reflect the reality of the Ainu’s living conditions. However, even with these limitations, the severity of the Ainu living and educational circumstances is clear. The Hokkaido Government reached individuals who deemed to succeed the Ainu blood in local community, or those living with descendants of the Ainu through marriage, adoption and so forth, and counted only those who identify themselves as the Ainu. A nationwide actual condition survey was recommended by the U.N. Committee on the Elimination of Racial Discrimination, but has never been conducted. The latest figures on the Ainu population outside Hokkaido are from an actual condition survey conducted in the Tokyo Metropolitan Area in 1988, in which it was estimated as 2,700. Of those who are employed, 36.0% are engaged in primary industry such as agriculture and fisheries. Even when those in secondary industry (such as manufacturing and construction) and those who run small- and medium-sized business in tertiary industry are included, the business scale of what most Ainu people are engaged is trifling. Over the 41 years, those engaged in primary industry decreased by more than half. On the other hand, those in tertiary industry increased by more than 2.6 times. Approximately 77.6% of residents said that life was ‘very difficult’ or ‘somehow difficult,’ showing a slight improvement from the last survey (81.1%). The number of the Ainu receiving welfare assistance is 1.6 times as many as the general Hokkaido residents however in terms of the ratio, indicating a slight deterioration. The ratio of those going to high school is 92.6% compared with the general average of 98.6%, and the ratio of those progressing to university is a low 25.8% compared with the general average of 42.0%. As education plays an important role in the improvement of the Ainu’s social standing, the alleviation of this disparity is an urgent priority. 23.4% of respondents indicated they had experienced discrimination since they can remember, and 9.6% indicated that they had not experienced discrimination against themselves but knew someone who had.